Pours a cloudy golden color with beautiful white head and lots of lacing… even though I did a bad job pouring the beer. Besides looking great this beer smells very tempting as well. Lots of flowers and a bit of hops in the aroma get me all excited for the taste. The taste is initially somewhat bitter, from hops, but smooths out quickly to a very great complex flavor. Wow, it’s a strong beer. Back to that great taste, there is some orange/lemon citrus going on, a little bit of spiciness, some sweetness, and then a little bit more bitterness on the after taste. There is a crisp smoothness (does that even make sense??) to the mouth feel that I Really dig. There is definitely some alcohol present but it’s not overwhelming and is honestly barely more than noticeable. This is one of the main features I love in all Belgians and Westmalle’s Tripel is a great example for that, it’s so smooth but half way through the glass and I can being to feel, but not taste, how strong it is at 9.5%. Easy rating I’ve ever given 5 out of 5. It’s no wonder so many beer reviewers rank this so high. It really is something special and amazing. It’s not too often you can have the beer that literally started the entire style. We don’t know what lager or porter or IPA really came first, with Tripels we do know. Westmalle started brewing this in their abbey in 1934, then made a few tweaks in 1956 and that’s still what is in my glass tonight. 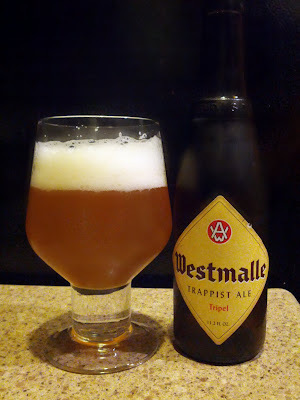 If anyone else out there has tried Westmalle’s Tripel share you thoughts in the comments below.